Greig-Smith PW. 1982. Behaviour of birds entering and leaving communal roosts of Madagascar Fodies Foudia madagascariensis and Indian Mynahs Acridotheres tristis. Ibis 124:529-534. The study was conducted on Silhouette Island, Seychelles, where both the Madagascar Fody and the Indian Mynah have been introduced, during December i978 and January 1979. In addition to counts of birds leaving and entering the roost, 111 fodies were captured, and many were individually colour-ringed, in and around the roost. Both roosts were occupied regularly, the Fody roost on all 17 nights it was visited. There were about 50-150 fodies, and small numbers of other species were sometimes seen in the Fody roost. Several colour-ringed Fodies were observed at the roost on later days, up to 34 days after ringing. Patterns of net movement in 5 minute counts varied little from day to day, most movements being concentrated in the hour before dusk and 45 minutes after dawn. Movement rates were higher for morning exits than for evening entries and exits were thus more synchronized than entries. Overnight weight loss was also studied. 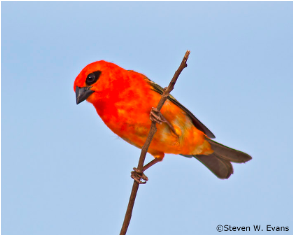 On average, red-plumaged males were heavier than 'brown' birds, but both were 4% lighter in the morning than evening. The morning and evening weights of individuals (corrected for differences in body size) were correlated indicating that heavier birds entering the roost were still heavier when leaving. The fodies roosted in mangroves, affording protection against predators. The above results are similar to the roosting patterns of a variety of weaver species (Oschadleus 2005, Weaver roost count in Hattingspruit, KwaZulu-Natal, South Africa. Pdf). The overnight weight loss is less than in other weaver species (Oschadleus 2001, Mass loss in Masked and Cape Weavers and Redbilled Quelea. Pdf).